Traditionally, player numbers in soccer are associated with a specific position. Teams are free to assign numbers as they choose, so there's a lot of variation from tradition. Numbers tend to match positions better in international soccer than in league play, where players tend to hold on to their numbers for the duration of their time at the club. 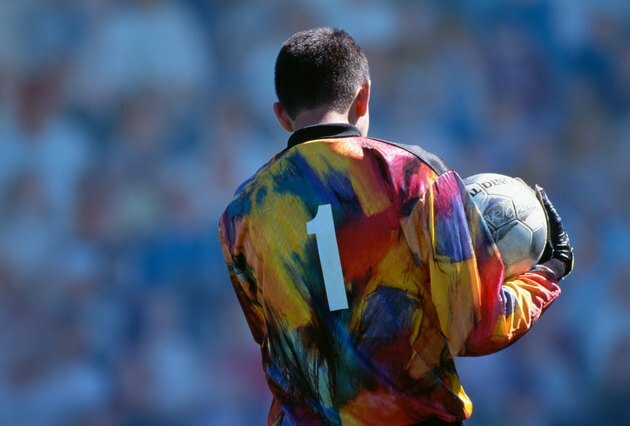 The first-choice goalkeeper of a team almost always gets the No. 1 shirt. For the defenders, No. 2 plays at right-back, No. 3 at left-back and No. 4 and No. 6 play the center. In a formation with five defenders such as a five-three-two, the additional central defender usually wears No. 4. The center of midfield is occupied by No. 4 and 8. The player wearing No. 4 tends to be the defensive “holding” midfielder, who stays a little further back during attacks. The No. 8 is the attacking midfielder who connects play between the midfield and the attackers. Number 11 plays on the left wing, while No. 7 plays up the right. When there are three center midfielders, the No. 7 joins the midfield on the right side. The attacking players usually wear No's 9 and 10. The No. 9 is usually the primary striker and better finisher, such as Mia Hamm, Alan Shearer and Ronaldo -- if a team uses a formation with one attacker like four-five-one, the lone striker would traditionally be the No. 9. The No. 10 is often the playmaker and more skilled on the ball of the two strikers, such as Messi, Maradona and Pele. Where there are three attackers, number 11 joins the attack. Teams often go against this standard numbering system. Sometimes, the numbers are retired. For example, no one will again wear the No. 9 worn by Real Salt Lake's Jason Kreis. One of the oddest breaks from tradition was Ronaldo's “99” shirt at AC Milan. James Daly of Unibet jokingly suggests this may have represented the Brazilian's weekly cheeseburger intake at the time. Yet as Akshay Mhasker of Football Speak points out, sometimes players find it hard to break from tradition. Ivan Zamorano, unable to wear his beloved No. 9 shirt, wore a "1+8" (No. 18 with a plus sign) shirt for two seasons.